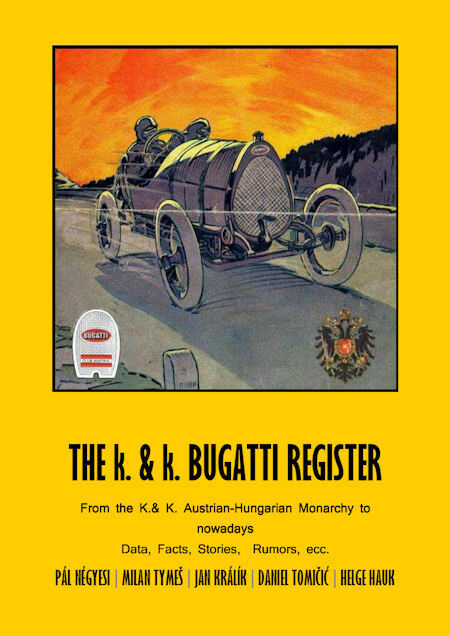 Among a lot of register books published by national Bugatti Clubs a big white area will be closed: The k&k Bugatti Register will cover all regions of the former k&k Austrian – Hungarian Monarchy, that means a major part of what is called now Mid Europe. We trace and research – as far as it is still possible now – all classic Bugattis until today (more than 250 cars!). The first Bugattis came into the country, when Austria still was an empire, and also all racing pilots as well as owners of the Bugattis up to the 1950ies or 1960ies were children of the Monarchy. This book will be written in 4 parts – particularly in the native language of the region and in English, it will have estimated 800 pages and will contain a lot of never before published photos and documents. The book will be published probably in 2014, and for all readers we offer the possibility to send us a non-binding pre-reservation, as the price of course is not yet fixed. All readers, who – from now on – want to reserve their copy/copies, will of course pay a subscription price, which will be 10% lower than the official price! To pre-reserve please enter our website www.bugatti-club-austria.at / News, fill in the form and click on ‘Send’! Thank you for your interest, Helge Hauk in the name of all co-authors! Graduated as dentist he loved classic cars in his entire life and – since about 25 years – especially the brand BUGATTI. He assisted in configuring the Bugatti Club Austria, whose secretary and registrar he is. Since 2008 he has been working on this book, which, following his words, “never will be finished, as there always are new things to discover”. An automobile industry analyst by the day, and an automotive historian by the night – this is what Pál's been doing for almost a decade now. He's a member of the Society of Automotive Historians and since early 2011 he's the editor of magyarjarmu.hu which covers the history of Hungarian motoring, including its automobile and motorcycle industry, motorsport and trade. Milan Tymeš (born 1961) is a technician and designer focused in automotive field. He had been collecting BSA motorcycles and bicycles, literature and ephemera since 1982. Having some 3 tons of BSA material he turned his interest on Bugatti. Because there is no chance of finding the same amount of stuff, Milan collects all information and pictures related to Bugatti and Czechoslovakia.